< Here at Sexyloops we have a number of sales outlets. First of all we have our own clothing label. 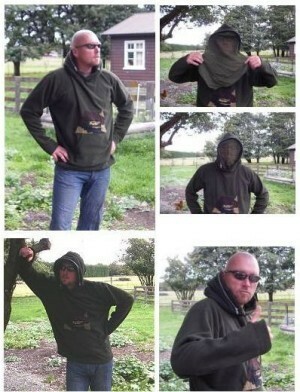 Handmade in New Zealand using designs unique to Sexyloops we manufacture fashionable garments suitable for fishing, hunting and general outdoor wear. In fact this stuff is so good that Paul wears it all the time. Apparently he thinks it's self-cleaning. All our fleece is recycled plastic bottles making us eco-friendly and if you have any special requirements we also make-to-order for only an additional 10%, email Vicky for enquiries. We aim to please and our orders are generally out the door the same day. 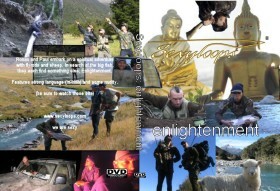 Sexyloops is also producing unusual flyfishing films. Paul's fantastic sense of humour (that no one else gets) is combined with flyfishing travel adventure and big fish. Sexyloops is site that brought you Fishporn, Manshit, God and the Mugwai Hunters. No other flyfishing site has done this. The Instructor is the first Sexyloops film. It features some great flycasting, Paul is the Instructor, Tonio the unsuspecting Frenchman, Camo-Guy on the Terminator Horn, flytying by death and one tailing loop. Our distributor is in the US and you can purchase here. Enlightenment is the sequel to The Instructor. Ronan and Paul embark on a spiritual adventure involving flyrods and sheep. This is a much more complicated film that no one understands. It really is a film about Enlightenment. Ronan discovers his Enlightenment through anger and Paul discovers his through Chillies and Red Wine. Purchase this important movie here.